Are you looking for the perfect gift but you have not found the right one? No problem, we offer a selection of accessories, shoes and latest clothing for every taste. 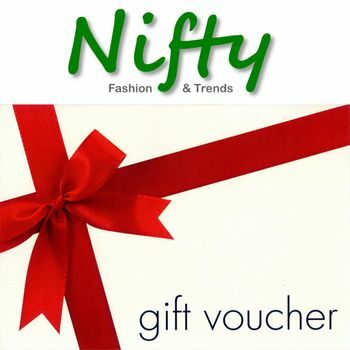 The Nifty online voucher worth £10 is a true gift of happiness :-) ! Simply purchase the voucher like any other item and after we have received your payment we will post your voucher to you. The voucher doesn't expire and of course can be redeemed for any purchase on our website. Only one voucher can be redeemed per order! Vouchers can only be used online once! Sorry, no cash refunds or refunds of remaining credit! Enjoy the Nifty voucher and give a gift to someone special!